Combining sophisticated shades of pink, orange, blue and green in stunning vintage designs, the Technicolor rug is the perfect addition to your home. Suited to the bedroom as well as the living room, this rug will add a pop of colour to your interior and can be matched beautifully with a few scatter cushions and a vintage lamp shade, creating a cosy and elegant room. Don’t let the price fool you. 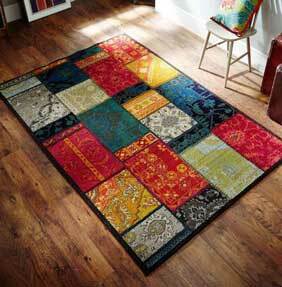 Just because these cheap rugs are affordable, doesn’t mean they are lacking in excellence. Made with high-quality yarn and using a modern machine weaving technique, these rugs are long-lasting, durable and will be enjoyed by you for years.